The profile.c add-on library contains functions for generating price or trade profiles, MAE charts, or seasonal analysis charts in [Test] mode. The functions are normally used during strategy development for analyzing trade profits or for finding seasonal effects. They can also be used as templates for building user-specific profile charts. Generates a price difference profile at the current bar. Call this function when entering a trade. The price difference profile shows the further price development at this point in the simulation and gives a much better insight in the development of the trade than just the profit or loss. From the average of all profiles, a price difference chart is generated after the test run. The red bars in the chart are the average price differences to the current bar in pips, the blue bars are their standard deviations, divided by 4 for better scaling. Price difference profile at entering a trade with the workshop 4 system. Note the small adverse excursion after 24 hours. 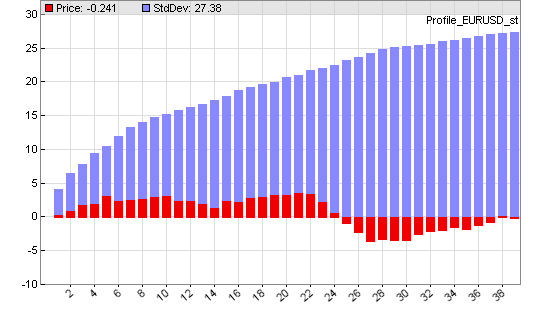 bars Number of bars to plot in the price profile..
0 = plot price difference to the first bar. 1 = plot price change from the previous bar. 2 = plot negative price difference to the first bar (for short trades). 3 = plot negative price change from the previous bar. Generates a profit distribution chart after the test run. The distribution shows the frequency of trades dependent on their profit or loss. The blue bars in the chart are the number of trades (right y axis), the red bars are the sum of their returns in pips (left y axis). The x axis is the trade profit or loss in pips. The example chart below shows a system with about 100 trades that hit their profit target at 100 pips, and about 30 trades that hit their stop at 100 pips loss. Inbetween there's a distibution of trades with mostly small losses. Note that the shown profit/loss is not exactly 100 pips due to spread and slippage. Profit distribution of a system with Stop and TakeProfit distances both at 100 pips. bars > 0 Number of bars to plot in the profit distribution. The more bars, the finer the resolution. bars < 0 Step width of the profit distribution in pips per bar. The smaller the step width, the finer the resolution. Generates a Maximum Adverse Excursion / Maximum Favorable Excursion graph after the test run. The Maximum Adverse Excursion (MAE) is the worst drawdown of an individual trade, the difference of its highest interim profit to its worst interim loss. The Maximum Favorable Excursion (MFE) is the opposite. The graph displays any trade as a dot in a chart showing its MAE or MFE on the x axis and its profit on the y axis in pip units or in percent. Winning trades are green, losing trades are red. This graph can be used for analyzing the exit behavior of the trades and finding the optimal stop or take profit distances. MAE graph of the Workshop 5 system. bars > 0 Number of bars to plot. The more bars, the finer the resolution. bars < 0 Step width of the MAE distribution in pips per bar. The smaller the step width, the finer the resolution. Seasonal analysis; generates a day, week, month or year distribution of a given value in a histogram (see also seasonal strength). This way seasonal effects of a trading system, a variable, or a price curve can be found. The red bars in the chart are the average value at a certain hour or day, the blue bars are their standard deviations divided by 4 for better scaling. Week statistics with hourly returns of the workshop 4 EUR/USD system. Note the seasonal oscillation of the standard deviation - a price curve effect known as heteroskedasticity. Analyzes the development of the value over a WFO cycle (x axis = trading days since cycle start). Can be used to determine if the profit deteriorates towards the end of the cycle, thus suggesting shorter cycles. value Value to be evaluated, for instance price(0) or Equity. 0 = evaluate value difference to the season begin. 1 = evaluate value difference to the previous bar. Plots bars equivalent to the gain or loss of the previous day, week, month, quarter, or WFO cycle in a new window in the price chart (thus, clicking [Result] is required). The blue bars are the profit in units of the account currency, the red bars are the loss. Since the bars represent the previous period, they are shifted by one period. Quarterly profit/loss of the Workshop 4 EUR/USD system. Generates in the EXITRUN a histogram of the correlation of a variable with itself, or with another variable, for sequential values of lag. On random data, such autocorrelations should be near zero for all time lags. But if the data is non-random, one or more of the autocorrelations will be significantly non-zero. The above correlogram displays a significant correlation (0.14) of the variable with its value from the previous bar. The correllations with earlier bars (2...49) are not as significant. Value1 First variable to be evaluated, for instance price(0)-price(1). Value2 Second variable to be evaluated. Helper function that plots a single histogram bar. Bars belonging to the same step range are accumulated. 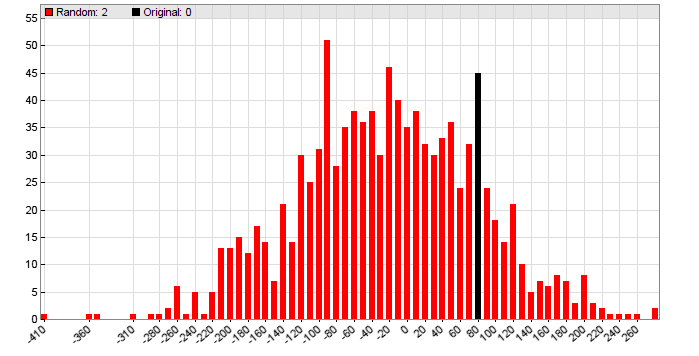 Name Name of the histogram. Val X axis position of the bar to be plotted. Distance between 2 bars on the x axis. Weight of the accumulated bar, affects the height. Color of the bar, must be the same for any Name. 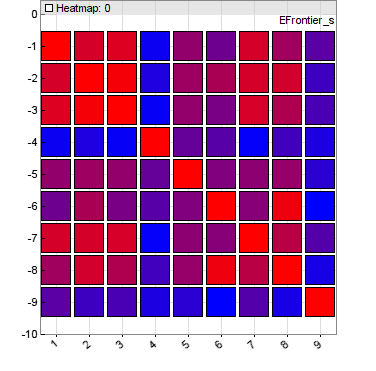 Plots a heatmap in the EXITRUN from the Rows*Cols matrix Data, f.i. a correlation matrix. The matrix elements must be in the 0..1 range, and are displayed as colored squares with a color range from blue (0) to red (1). For exporting heatmaps with the interactive chart viewer, scale them before so that they look nice. Data Pointer of a var array with N * N elements. All profile functions are contained in source code in include\profile.c, and can be used as templates for writing other chart plotting or analysis functions of any kind. For adding the profile functions, the line #include <profile.c> must be added at the begin of the script. The profile or distribution charts must only be plotted for a single asset and algorithm, since every market and every system will generate a different profile. In a portfolio strategy, temporarily disable the other assets and algos for plotting a profile of a component. Only one chart can be plotted, not several at the same time; unused plot commands must be commented out for not interfering with the active chart. The size and resolution of the chart can be set up with the plot parameters. The charts are only plotted in [Test] mode, not in [Train] and [Trade] mode. The week, month, and year analysis is based on trading days, not real days. Therefore the week has 5 days, the month 22 days, and the year 260 days. Due to the different number of trading days (20..23) in a month, they are normalized to 22, so day 22 is always the last trading day of the month. The standard deviations (blue bars in the chart) show how much the values differ from their average, and thus indicate the significance of a nonzero average. The smaller the blue bar and the bigger the red bar, the more significant is the seasonal effect. In the case of prices or returns, the standard deviation is a measure of volatility. When developing a strategy, it is helpful to examine the price difference profile at every trade entry bar for verifying the trade entry rules and for determining the trade exit rules.